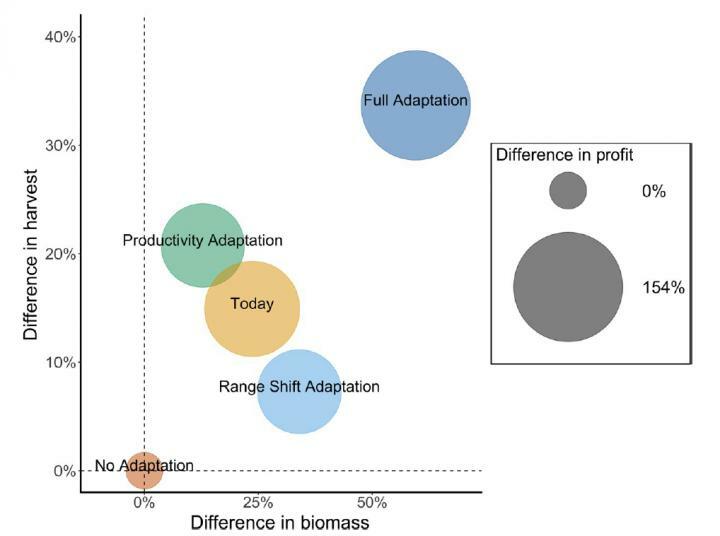 Global commercial fish stocks could provide more food and profits in the future, despite warming seas, if adaptive management practices are implemented. Even so, yields for nearly half of the species analyzed are projected to fall below today's levels. Researchers from Japan's Hokkaido University, the University of California, Santa Barbara (UCSB), National Center for Ecological Analysis and Synthesis, and Environmental Defense Fund (EDF) found that harvesting sustainable amounts of seafood globally over the next 75 years can lead to higher total food production and profits, even taking into consideration the fish populations which are projected to decline as the ocean warms and habitats change. This is because, under what has been determined as the best management scenario, some major fish and shellfish stocks that are commercially harvested, broadly referred to as fisheries, will grow and become more profitable, offsetting the many others projected to shrink or even disappear. On a global average, profitability could rise by 14 billion USD and harvest by 217 million metric tons above today's levels, according to the study. There is a catch. In the model, the growth was achieved under the projected moderate warming of 2.2°C (3.9°F) above average global temperatures by 2100. But if temperatures rise further, global fish harvest and profits are expected to decline below today's levels even with the best management in place. "If we continue to work toward developing adaptive fishery management strategies, and we commit to the international agreements for climate change mitigation and emission reductions, the future may be overall brighter than so far anticipated," says aquatic ecologist Jorge García Molinos of Hokkaido University. In an effort to capture a global picture, the models did not incorporate other factors that influence marine populations, including species interactions and other stressors besides warming. "Fitting more of these elements into the big picture will be important for improving predictions and should be the subject of future work," says García Molinos.